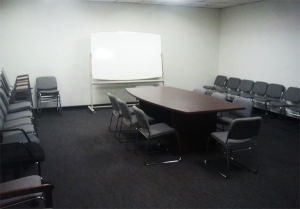 This space on the third floor is perfect for classes, presentations and groups of up to 32 guests, with a white board, small meeting table, and plenty of configurable seating. Please note that this room has only the one table shown. Please note: these rooms are rented only when there are no first floor alternatives (rooms 111 or 114) available during the time and date of your request. If you choose one of these rooms as the preferred space on the reservation request form, we reserve the right to place you in room 111 or 114 first, if available.